2019 Florida Minimum Wage Notice Now Available! On January 1, 2019, 20 states, including the state of Florida, are set to increase the minimum wage. Employers are required to pay employees at least the new minimum wage rate and post a notice in the workplace to inform employees of their right to receive the minimum wage. The Florida Department of Economic Opportunity has released the 2019 Florida Minimum Wage notice with plenty of time to spare for employers to comply by the new year. What do employers need to know about the 2019 Florida minimum wage? The current Florida minimum wage law was passed ballot initiative in 2004. Voters chose to amend to state constitution to increase the minimum wage each year by the rate of inflation as measured by the Consumer Price Index for urban wage earners and clerical workers (CPI-W) in the South Region. Between September 1, 2017 and August 31, 2018, the CPI-W index rose by 2.9%, leading to a 2.9% increase to the state minimum wage. Minimum wage rate for non-tipped workers: $8.46 per hour. Minimum wage rate for tipped workers: $5.44 per hour. Get the 2019 Florida minimum wage notice now! 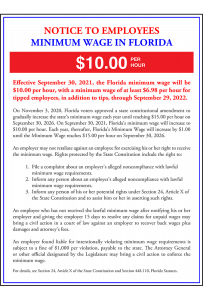 If you already own one of Compliance Poster Company’s signature products, you can replace your outdated Florida Minimum Wage notice with the 2019 Florida Minimum Wage Notice Peel ‘N Post™ sticker for only $9.95. 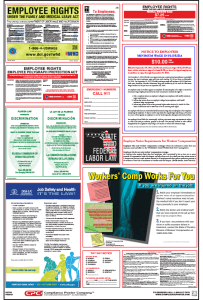 If you’re looking for a complete compliance solution, order a fully up-to-date 2019 Florida All-On-One™ Labor Law Poster, consolidating all state and federal required postings onto one convenient and attractive wall poster, or a Florida Mobile Poster Pak™ booklet for mobile and off-site workers or your HR reference desk. Florida products are available in English and Spanish. January 1 minimum wage products begin shipping on December 3.